Chinese Internet giant Baidu has announce it will begin paying royalties on every piece of music downloaded from its site, after years of being criticized as acting for a haven for file-sharers and music pirates who are distributing music and other media in violation of copyright. Baidu will make payments to the Music Copyright Society of China—loosely equivalent to ASCAP or BMI in the United States—who will in turn be responsible for making sure proper payments trickle down to songwriters. The agreement does not include compensation to be paid to record labels or music distributors—according to a Baidu spokesperson, that would require a different arrangement. 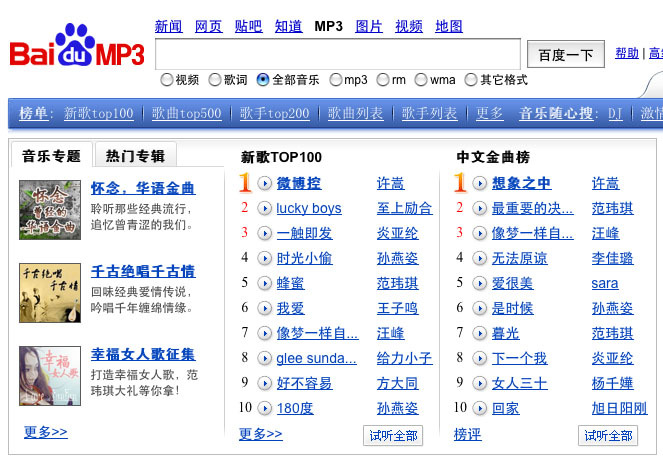 Baidu has been criticized for years for offering “deep links” to pirated music and MP3s via its search service. Baidu skirted the issue by claiming it was not actually hosting the infringing files and so was exempt from any requirements to obtain distribution agreements or pay royalties. However, Baidu’s de facto position as the leading music search engine in China led to the company being targeted by innumerable lawsuits, including a suit from the Music Copyright Society of China. Baidu has not yet indicates how its royalty agreement will impact users, and if downloading material via the site will continue to be free. Baidu says it plans to create an online clearinghouse for fully-licensed music, and some online reports have Baidu working on creating a paid download market for music. However, the traffic generated by Baidu’s MP3 search business alone might be enough to persuade the company to keep downloads free. The announcement comes just days after Baidu removed millions of pirated books from its Baidu Wenku online library, and announced plans to work on a revenue-sharing agreement with authors.